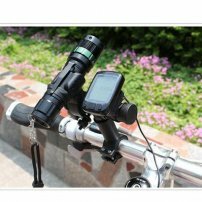 Seatpost / Handlebar T-Shaped Bar Extender for Flashlights / Stopwatch / Speedometer : allputer.com - Accessories for all your Portable Electronics & Computers! If your handle bar is currently over crowded with items like a light, phone holder, water bottle cage etc. And would like to move stuff around. This is the item for you!